Kennel cough in dogs can cause alarm in their owners. 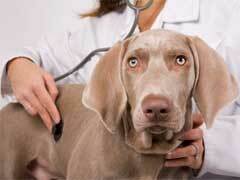 Understanding the kennel cough symptoms to watch for is important for the health of your dog. The first sign of kennel cough in dogs is the actual coughing. Because this is an upper respiratory infection, dogs will cough and may also have a watery discharge coming from their noses. Although we associate these symptoms in humans with the common cold, the condition can worsen for dogs. Without treatment or with several infectious agents (both bacteria and viruses can cause the condition) working against your dog’s health, your dog’s symptoms can worsen to include loss of appetite, fever, and lethargy. If the illness progresses your dog could develop pneumonia and/or die from this condition. The good news is that kennel cough treatment can stop the disease, especially if it is caught early. For animals with a mild case of kennel cough in dogs, bronchodilators can be used to treat the condition. These medications help open up the airways to make it easier for your dog to breathe and to get rid of the congestion. Antibiotics may also be given for mild cases, but they are fairly standard treatment in cases that have progressed. Kennel cough in dogs should not be treated with steroids, however, because they can reduce the immune response and actually make it harder for dogs to fight off the virus or bacteria causing the illness. You may also want to consider a kennel cough home remedy. For example, if you run a hot shower in your bathroom so steam builds up in the enclosed space then let your dog go into the room to breathe in the steam it can have the same positive benefits for him as it does for humans. The kennel cough vaccine is the best form of protection for your dog. Your vet may recommend either the injection or the nasal spray version of the vaccine for your pet. Both can protect your pet from developing kennel cough in dogs, especially if he is boarded frequently, attends training classes with other dogs, or goes to doggie daycare regularly. Discussing the risks of kennel cough in dogs and the vaccines available with your vet is a good first step in protecting your pet’s health.